For years I have been writing accommodations that I have made, or the general education teacher has made, on assessments, projects, and other graded assignments. I write very small on the back of the assignment, so that the other students wouldn't be able to read/see it when the assignments were handed back to the students. I like this method of documenting what I accommodate and the parents love it as well. I've come to the realization over the years that students - yes, even high school students - don't always know their assessments/assignment are modified due to not knowing what their classmates' assessments/assignments look like. At the beginning of this current school year, as I was documenting accommodations made on one particular test, I realized that I was writing pretty much the same accommodations on ALL ten tests. I had to revamp my system. Accommodation Labels are labels that list my most frequently used accommodations for tests, projects, classwork, etc. I print a few labels/pages out at the beginning of the school year and then always have them on hand when needed. I check off each accommodation that I made. I also sign my name at the bottom of the label. This has been an INCREDIBLY huge time saver. - You will be receiving one print-&-go ready label template. This is the template I use for all classroom based assessments. This templated cannot be edited. - You will be receiving one fill-in template. This label template can be designed by you to best fit your classroom's accommodation needs. This template cannot be edited, however, you are able to fill-in each box with the accommodations you most frequently use. I spent extra time on my end creating this, so you didn't have to! I have included my most commonly used accommodations for classroom based assessments. I have designed this template to be fill-able. Once you type in the first box on one label, it will appear in the first box on each label (watch the video preview to see just how easy I made it for you to use). 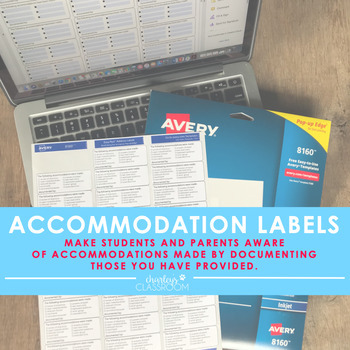 Make as many accommodation labels/pages you need by saving them each differently, for use on every assessment/assignment you are accommodating. These were created to be used with Avery Labels 8160. You will be receiving this as two separate PDFs. if you have any questions before purchasing, do not hesitate to ask! Want to see this resource and others put to use in my classroom?